Maui was the youngest child of Hine Taranga hence the name Maui top knot of Taranga. Maui was renowned for many extraordinary supernatural deeds, he brought fire to mankind from Mahuika’s fingernails, he fished up the North Island using the Matika- special fishhook made from the jawbone of his grandmother Murirangawhenua, Maui slowed down the sun to give us a 24 hour day, Maui was magical and mysterious. Maui was both brave and frivolous, Maui was a gambler, he took on all odds. 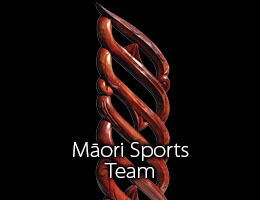 It is appropriate therefore that the trophy of Maui is awarded to the Sports Administrator since the administrator has to do battle on all fronts, requires a repertoire of talent and devices in order to be successful. 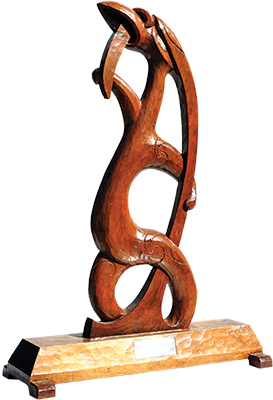 Ko Māui te pōtiki ā Hine-Taranga I puta ai tōna ingoa ki te tikitiki o Taranga. He rongonuihia ā Māui mō āna mahi pērā I te koha I te ahi ki te ira-tangata mai I ngā maikuku o Mahuika, nāna hoki I hī mai I Te Ika-a-Māui mā te Matika I hangaia nei mā te kauae o tōna kuia ā Murirangawhenua, nā Māui hoki I whakarata I ā Tama-nui-te-rā kia whiwhi ai tātau I ngā rua tekau mā whā hāora, he tangata toi-tū, toi-ora. He tangata kaha, he nanakia, he haututū ā Māui. Nō reira ko te taonga ā Māui me haere ki te Kaiwhakahaere Hākinakina e kaha nei ki te pakanga I mua, ki te tū mārō I ngā wā katoa.